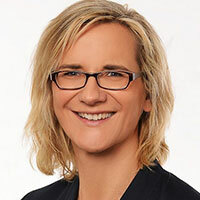 Jana Brendel is responsible for PW&CC Digital Solutions. This division delivers innovative digital solutions for all IT applications along the customer interface and data analysis. The current focus of her work is the setup of the customer centric agile software development unit and the implementation of the digital agenda. Since 1998, Jana Brendel is working for DB in different functions. The most important stages were the role of the CIO Application Development for Private and Commercial Clients, the lead programme management in Magellan and miscellaneous strategy formation projects. Jana learned IT from the scratch. Before she joined DB, Jana worked since 1991 as software developer and project manager in medical engineering. She has a degree in business information systems. For her, the most important part of IT is to use technology to facilitate client added value and business development. Jana Brendel is married with one daughter and three stepsons and lives nearby Wiesbaden.